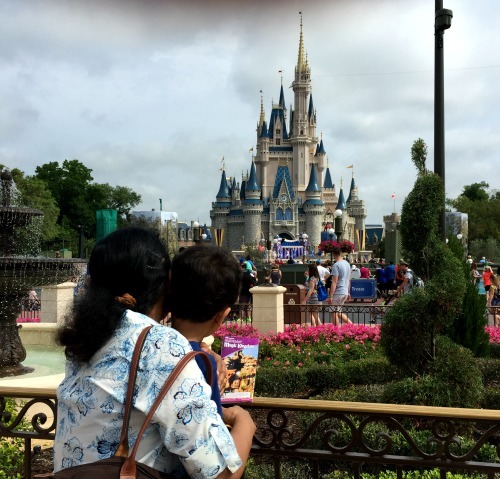 With favorite character sightings and magic castles, visiting Walt Disney World with grandparents is a dream come true for families. My husband, toddler son and I visited with my mother and discovered a few helpful tips that made it enjoyable and comfortable for a multi-generational group. Booking the right hotel, making dining reservations, coordinating transport and planning activities that are inclusive of everyone’s abilities can enhance the trip and make it a truly unforgettable experience. accomplishments. A chance to be a part of my mother’s and son’s first Walt Disney World experience was a truly special moment. When I think about what made this trip so memorable, it was that our Disney vacation embodied what we really enjoy; affordable luxury accommodations, gourmet food and most importantly the ability to experience new things together. 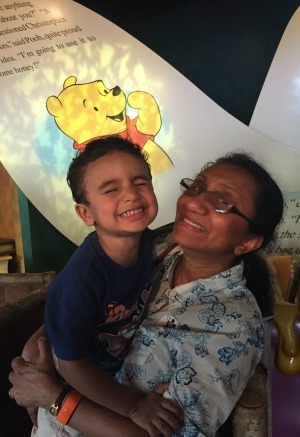 I watched my mother meet old Disney favorites and discover new characters through my son’s initiation. To make this trip memorable and comfortable for our multi-generational group, we spent time carefully planning activities and arranging logistics. 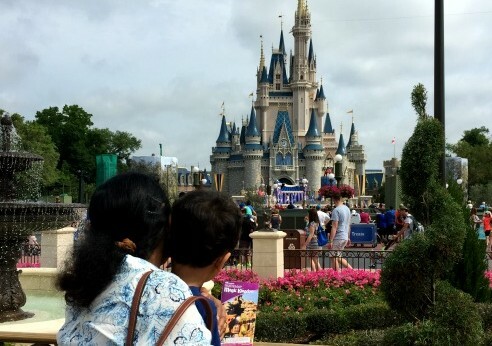 Here are 7 tips for visiting Disney World with grandparents that worked for us. 1.Stay on property at World Disney World. If you decide to stay at a Disney resort, the magical experience starts as soon as you get off the plane. You can walk directly to the resort transportation, Magical Express bus, without even having to pick up your checked luggage and get it directly delivered to your room. The colorful magic bands will thrill grandparents and toddlers alike. They can access their rooms, resort facilities and parks, dine and do souvenir shopping with a swipe of their wrist. With Disney transportation options, staying on property makes it the most convenient and time efficient to get back and forth. There are Disney properties within a wide price range. It is definitely worthwhile checking out resorts such as Art of Animation,Boardwalk Inn or the Coronado Springs to see what best suits your needs and budget. When planning travel with adults and young kids that require spending most of your day outdoors on foot, the weather plays a huge role. So decide on what everyone can handle before booking your Disney vacation. The height of summer may not be the best if heat and humidity get to be too much to handle. Instead look into traveling in the cooler months. 3. Focus on Disney rides and attractions for all ages. What makes Walt Disney World such a remarkable place for families is how many of its attractions can include babies to grandparents. 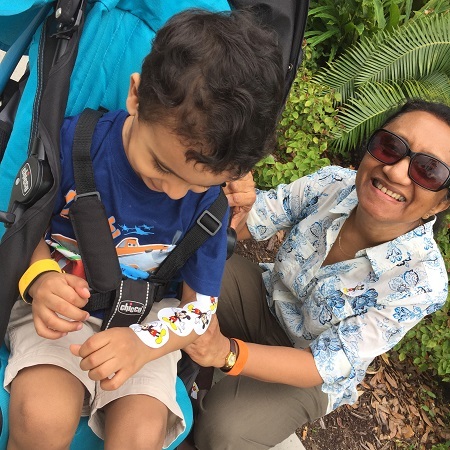 Instead of making a beeline for thrilling roller coasters on our previous couple only visits, this time we focused on Disney rides that would be inclusive of my mom and son, who were less than inclined to try adventurous rides. 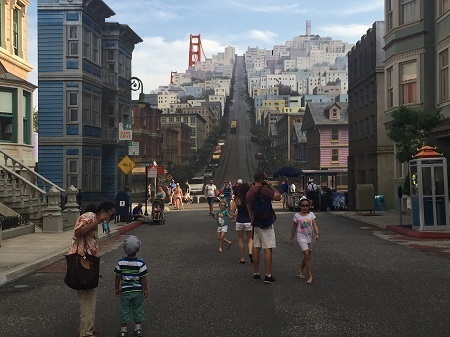 Almost every section of each park had an attraction that a multi-generational group could enjoy. It’s a Small World, The Many Adventures of Winnie the Pooh (Magic Kingdom), Killimanjaro Safari (Animal Kingdom), The Seas with Nemo and Friends, Living with the Land (Epcot), The Great Movie Ride (Hollywood Studios) were some of our favorite rides that my mom and son could enjoy. In addition to the Disney rides, there are also live performances and shows that can be enjoyed in the comfort of an auditorium. We loved the 3-D Muppets show at Hollywood Studios and the musical Finding Nemo at Animal Kingdom. Character experiences that are dispersed throughout the parks are another aspect that grandparents can really enjoy, whether it is posing with the kids or taking photos themselves. It helps to plan the day around activities the whole group can enjoy and decide on break times for grandparents as needed in between. The gourmet food is a big part of the Disney experience that is often overlooked when you focus purely on attractions. While tasting some world-class cuisine, it will also be a chance for everyone to relax and connect in leisure. There can only be so many pizza and hot dog meals that grandparents can be expected to eat. It is advisable to make reservations at least two weeks in advance (may even be a month ahead for some popular restaurants like Be Your Guest at Magic Kingdom). But do check even last minute as there could be cancellations and some restaurants are large enough not to be fully booked. 5. Maximize transportation around the parks. Along with great transport options to the park from its resorts (shuttle buses, boat, monorail), there are several ways to get around the parks as well. It is useful to research this ahead of time so you can take advantage of it before the party gets too fatigued from walking. In Magic Kingdom we took the WDW Railroad to get from Frontierland to Fantasyland to conserve energy. The Liberty Belle cruise around Tom Sawyer Island is another opportunity to relax while sightseeing. At Epcot we relied heavily on the friendship boat from the start of the start of World Showcase to Morocco and Germany. 6. Remember to capture memories. Photos are going to be such an integral part of any trip to Disney. It is important to capture all the key moments but not overwhelm your party by taking too many photos. Limit yourself to one or two photos at any location. You can also take a few practice photos before getting grandparents and kids to pose. The Disney Photopass is another option that can facilitate grandparents’ ability to pose in photos easily with their grandkids at character encounters and iconic attractions where the photographers are available. They only need to scan their magic bands or get a pass from the photographer to access the photos online. 7. Make note of special festivals. Walt Disney World has an itinerary full of various events and festivals that last through the calendar year. It would be especially memorable if you could time your visit to coincide with one of these events. When we visited during Epcot’s Flower and Garden Show, my mom especially enjoyed the topiaries and the emphasis on fresh food as she tasted from many of the outdoor kitchens. The Mickey’s Not So Scary Halloween Party and Epcot Holidays Around the World are a few of the other festivals we hope to see during our future visits. With so many cultural festivals from around the world, there is always likely to be a celebration to look out for when you visit Disney. Some of these events require a special ticket. Traveling Mom recommends Parksavers for discount Disney World tickets. Even better, use code TM2 for an extra $2 off each ticket, just for Traveling Mom readers! Having shared this experience with my mom and son, I now understand why Disney can be such a magical experience for families. From simple things like the Mickey ear shaped light pattern at the hotel lobby to the attention to detail on the Winnie the Pooh ride, almost every moment resulted in us discovering and sharing something extraordinary together. How Disney manages to appeal to the senses of a toddler as well as a grandparent is what truly distinguishes it from other places we’ve visited. We hope to be back again and build on these memories. 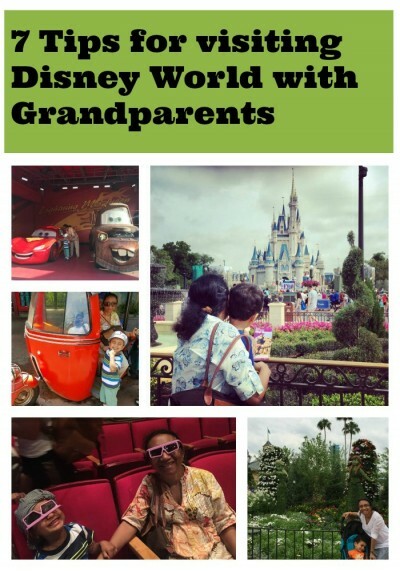 Have you visited Disney with grandparents? What are your tips for enhancing a multi-generational trip to Disney? Next Post: Is it Safe for a Family to Travel to Mexico? I took my kids and 5 year old granddaughter for 7 days over Christmas 2014. I hit the wall on day 5 and just could not move at a normal speed. I rented a scooter and it was a vacation saver! They also sent me to the Grand Floridian spa for one of the days. Everybody had the best memories from our vacation!